Knesset rejects bill to remove legal status of institutions such as Jewish Agency, Jewish National Fund. 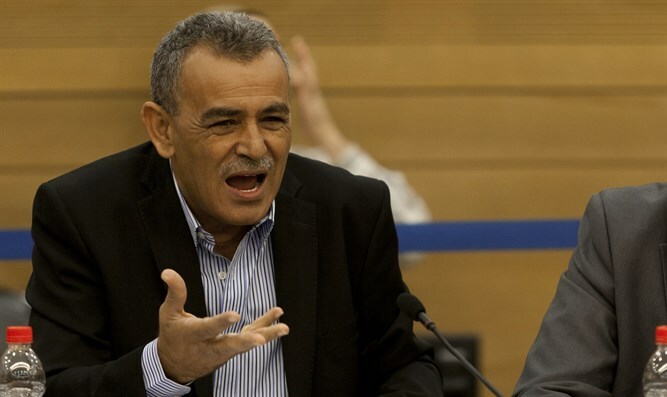 The Knesset rejected Wednesday a bill to cancel the legal status of certain national institutions submitted by Balad chairman MK Jamal Zahalka. The bill, which received support from MKs from the Joint Arab List and MKs Issawi Freij of Meretz and Zuheir Bahlul of the Zionist Union, was rejected by a majority of 67 MKs. MK Zahalka explained the proposal and said that the legal status of the Jewish National Fund, the United Israel Appeal, the Jewish Agency, and the World Zionist Organization is the 'main instrument of discrimination' against Israel's Arab citizens. "Sometimes it is not clear whether these institutions are an instrument of the state or the state is an instrument in their hands. In any case, they continue to exist after the establishment of the State in order to allow discrimination and exclusion of Arab citizens in all matters relating to land and the establishment and development of settlements." Zahalka said that it is impossible to support equality and to continue to support the legal status of these bodies. He asked: "How is it different from an existing fund that prevents its regulations from selling or renting land to Arabs from Safed rabbis who issue halachic rulings forbidding renting apartments to Arab students?" The special status accorded to these institutions stems from an ideology based on discrimination and based on racial segregation between citizens, and the criterion that determines service and legislation should be equality, regardless of religion, race, nationality or gender." "It was a Jewish state, it is a Jewish state, and it will continue to be a Jewish state, even for the next 1000 years, and also in the face of the efforts of Zahalka and his colleagues. The national institutions preceded the establishment of the state and they are a powerful instrument of the Jewish people. We have not yet finished absorbing the last Jew, so the Jewish Agency will continue to work on encouraging Jewish aliyah. "We have yet to develop the country, plant forests, build water reservoirs, take care of the national lands, and therefore the JNF will continue to exist. Zahalka, who seeks to abolish the national institutions, does not seek equality. This equality has existed from the first day of the State and is firmly rooted here. What Zahalka wants is to abolish the Jewish image of the State of Israel. This will be preserved forever! This was and will remain the state of all the citizens living here, but Israel will always be the nation-state of the Jewish people, and the government opposes the proposal (and rejects it with disgust)," Shaked said.